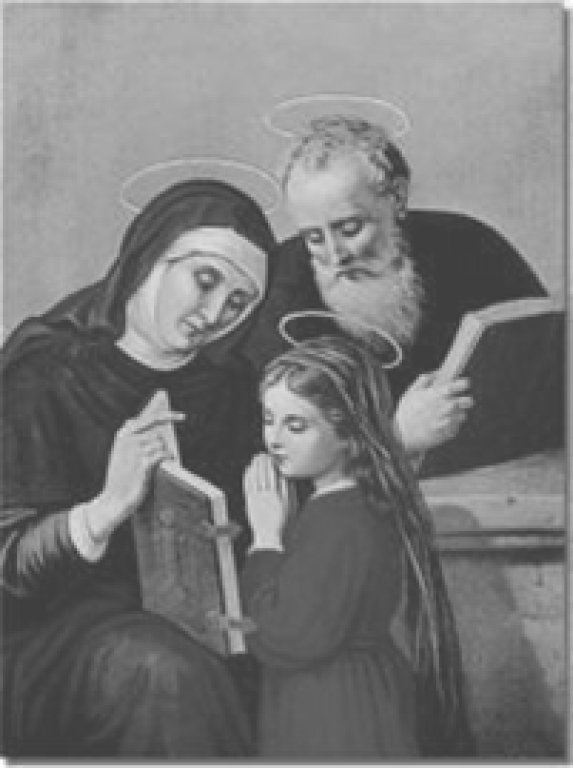 Occasionally on Thursday, after daily mass, the parish says a novena to Saint Anne & Saint Joachim the parents of Mary. This Novena is only said when daily mass is offered Thursday. Thursday mass is not always offered. Great and glorious patriarch, St Joachim, and good St. Anne, what joy is mine when I consider that you were chosen among all God’s holy ones to assist in the fulfillment of the mysteries of God, and to enrich our earth with the great Mother of God, Mary most holy. By this singular privilege, you have become most powerful with both the Mother and her Son, so as to be able to obtain for us the graces that are needful to us. And since you were a perfect pattern of the interior life, obtain for me the grace to pray earnestly, and never to set my heart on the passing goods of this life. Give me a lively and enduring love for Jesus and Mary. Obtain for me also a sincere devotion and obedience to Holy Church and the sovereign pontiff who rules over her, in order that I may live and die in faith and hope and perfect charity. Let me ever invoke the holy Names of Jesus and Mary. And may I thus be saved. Amen.